A patient was regarded a potential candidate for transluminal assisted repair if the ulcer was < 1 cm in size and the other criteria above applied. 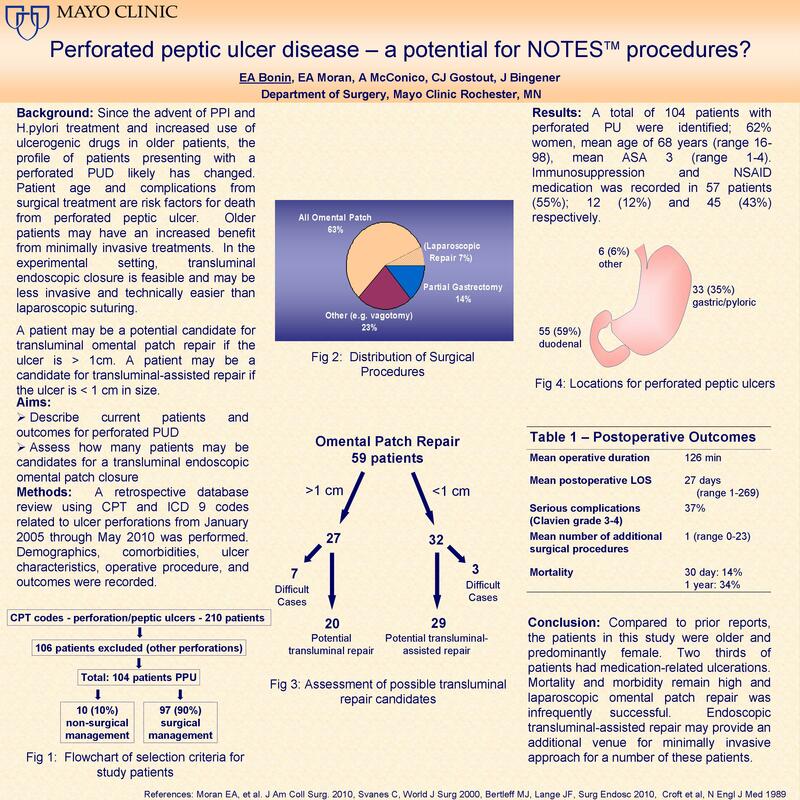 Results: A total of 104 patients with perforated PU were identified; 62% women, mean age of 68 years (range 16-98), mean ASA 3 (range 1-4). Immunosuppression and NSAID medication was recorded in 57 patients (55%); 12 (12%) and 45 (43%) respectively. Non-operative treatment was chosen in 10 patients and 94 patients underwent an operative procedure: 59/94 (63%) an omental patch (48 primary open, 11 attempted laparoscopic, 4 converted to open), 13/94 (13%) underwent partial gastrectomy due to large ulcers and necrosis, and 22/94 (23%) underwent other procedures such as wedge resection. Ulcer locations were: 55 (59%) duodenal, 33 (35%) gastric, 6 (6%) other. Mean operative duration was 126 min. Thirty-day mortality was 13% and one-year mortality was 34%. Major morbidity (Clavien 3 or 4) was 37%. The mean number of additional operations needed was 1 (range 0-23). Mean postoperative LOS was 27 days (1-269). Of 59 patients with an omental patch repair, 27 had an ulcer > 1cm, which would allow the passage of an endoscope; 32 ulcers were < 1 cm (endoscopic tool assist possible). Ten with an omental patch repair were deemed to be difficult cases due to massive abdominal contamination, associated bowel resection, or bowel ischemia. Conclusion: Unlike prior reports, the patients in this study were older and predominantly female. Two thirds of patients had medication-related ulcerations. Mortality and morbidity remain high and laparoscopic omental patch repair was infrequently successful. Endoscopic transluminal-assisted repair may provide an additional venue for minimally invasive approach for a number of these patients.